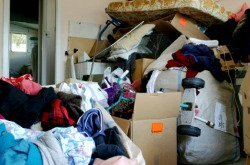 Do you want to declutter your home, but don't know where to start? That is completely normal, because clutter is a problem in almost every modern home because of our consumer lifestyles and economy. Since almost every home has at least some problems with clutter control (even those that look great may have some big stashes of clutter stuffed in a closet or two) it is no suprise we get overwhelmed with it all. The articles below are designed to help us all understand clutter, to learn how to declutter, and then how to keep our houses decluttered from now on. Organizing clutter - can it be done?